Don't wait for your boss to offer you a promotion. The truth is you're in business for yourself even if you get a regular paycheck. Today, everyone is a contingent worker. Your business is "Me Inc." and you need to have a business plan for your career based on your personal career strategy. There is no doubt that to get your best career opportunities you must be recognized as an achiever. We place our confidence in people who set goals and achieve them. Yet I have coached many high achievers who languish in a swamp of unrecognized effort fighting the alligators of frustration. Many of these professionals ask me "Is it me . . . is it something I'm doing?" My answer is for the most part it's what you're not doing that has you stuck in the mud. Then I teach them the one thing that leadership research indicates is the greatest predictor of getting promoted. It is very simple. Be strategic. Managers and professionals who communicate their concerns and priorities through the lens of their employer's business strategy are seen as people who "get it." "It" simply means that you can articulate the strategy espoused by the CEO that will help your enterprise grow and profit. It sounds simple enough, but I've found relatively few people who are thoughtful about how to elegantly link their priorities and projects to the business strategy. Instead, most people talk about their goals as tasks that they have been given. This is one reason so many people in the middle of organizations, especially women, get stuck in a career swamp. Most organizations are based on medieval structures with Kings at the top and peasants at the bottom. This is what virtually every organization chart looks like. It assumes that the people on top know what needs to be done, and the people below them just need to show up and do what they are told. Of course, this is madness. For instance, it has been clear for decades that the people closest to customers have a much richer understanding of what customers value. We also know that people doing the work are much more likely to have great ideas about how to improve the efficiency and effectiveness of how that work gets done. Medieval organizational structures favor authoritarian personalities who create rules and rituals to concentrate power at the top. Unfortunately, the linkage of power and ignorance creates most of the suffering found in your career swamp. This is how I help people climb out. It has 2 major steps. First, make a super simple SWOT map of your company or division. 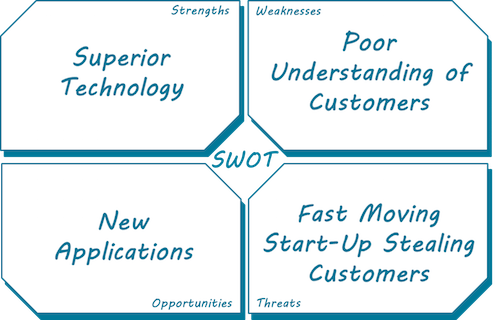 SWOT is the consulting term used to summarize a company strategic position. These first two categories express the internal reality of the enterprise. The last two categories express the external world your enterprise operates within. I advise clients to make this very simple. 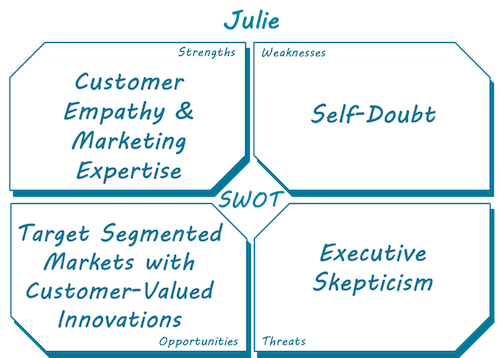 Understanding SWOT is a measure of your contextual intelligence, which is one of todays critical competencies needed to lead. People with high contextual intelligence can become an expert at simplifying complexity. Bain & Co. confirms that women generally have greater contextual intelligence than most men. This is critical. Most organizations have reached what consultant Dan Sullivan calls the "Ceiling of Complexity." It simply means that there are so many interactive effects of technology, new business models, competitor moves, social media, consumer tastes, regulations, finance, investor confidence etc. that human reasoning is simply overwhelmed. Our brains response to cognitive exhaustion is to shut down our higher reasoning capability and to descend into the whirlpool of emotional logic. Thus it is critical for today's leaders to be experts at synthesis and simplification. 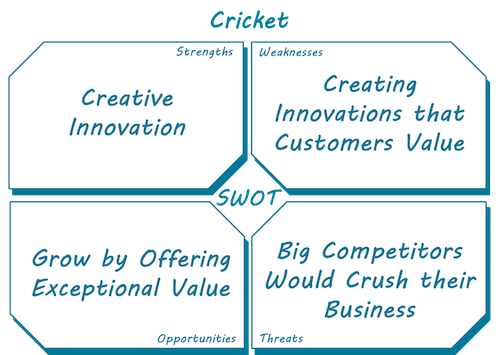 So, I challenge my clients to just put one important idea in each of the four SWOT boxes. This is going to be the way they talk about the strategic agenda of their enterprise. 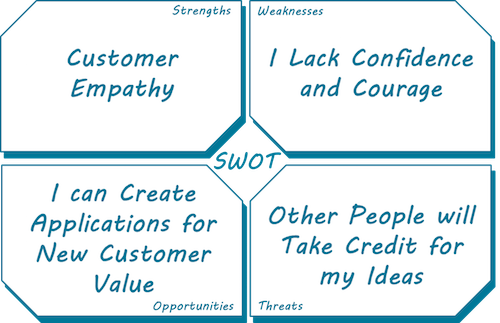 The second exercise is to create your own simple SWOT so you can clearly understand where your best opportunity is to impact your organization's success. Most people don't do this and that's unfortunate because it's at the intersection of your organization's strategic vision and your career vision that your best opportunities exist. So, go ahead and create your personal SWOT. Again, just right down your greatest career strength, your most crippling weakness, your greatest opportunity and you're most feared threat. Now you just connect the SWOTS. Your goal is to use your greatest strength to optimize your organization's strength and minimize your organization's weakness. Your focus is to contribute to your organizations' best opportunity while eliminating or lessening external threats. The way you can do that is by over-investing in your strengths and opportunities while making your weaknesses irrelevant. If this sounds complicated, it isn't. It's simply a new way of framing your current job so you can turn it into a career launch pad. It's a method using contextual intelligence not just to solve other people's problems, but to upgrade your opportunities. So here is a real-life example . . . So as you can see their strength was innovation but their weakness was too many innovations that customers did not value that made their customer experience confusing and unpleasant. Their weakness was that although they were a $3 billion company they were tiny compared to Verizon and AT&T. As you can see, if we could link Julie's strength in customer empathy to a few focused innovations that customers really valued, she could make a strategic impact. She also recognized that the greatest growth opportunities would come through market segmentation of which she was an expert. So in a very short period of time, she created a dedicated team that developed data showing what market segments had the most value for Cricket's value proposition, and what innovation would do the most to drive growth. That innovation turned out to be smartphone (iPhone and Galaxy) financing for Latinos and other sub-segments who bought cell service on a month-to-month, no contract basis. Initially, this idea was thought to be impossible to pull off but when Cricket got enough smart people to stop doing things that didn't matter, and to focus on something that did, breakthroughs happened daily. Company growth took off and Cricket was sold at a high premium to AT&T. I don't want you to be skeptical about whether this technique of matching your company SWOT and your SWOT will work for you. You might think that because Julie was a senior leader it was a lot easier for her to make things happen. It wasn't. She was the only woman on the senior team which was populated by very strong blue-brained, analytical men who are trying to save the company by simply saving money. Her weakness was her self-doubt which she learned to ignore. Her threat was a very smart and outspoken COO naysayer that she won over. Julie had to present her business case with clear data and evidence as well as a consistent calm that communicated strength and resolve. 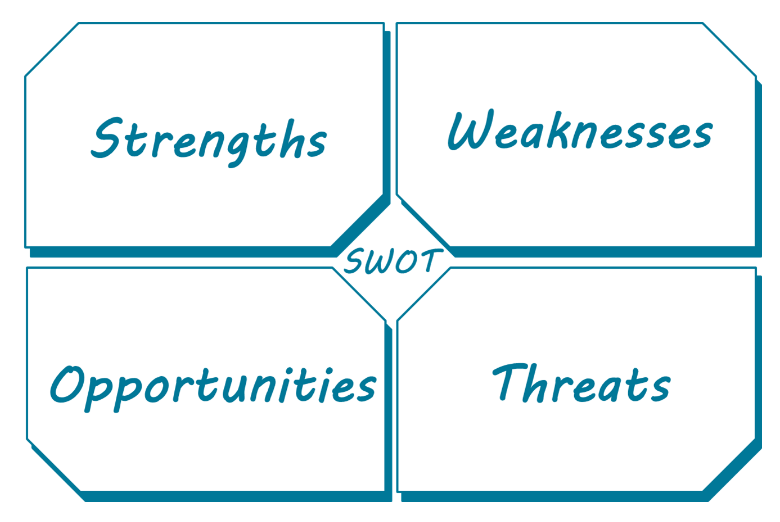 This simple technique of connecting your professional SWOT to your organization's strategic SWOT will drain the swamp of a career mired in missed opportunities. Of course, there is one more thing. If you can't find a connection between your competence and passion and your organization's strategic intention you need to use your SWOT to find a new organization. Research shows that one of life's great regrets is working for the wrong employer for too long. You have too much to offer to waste your time and precious energy working for fools. Be wise and be bold. Make your difference. P.S. If you want to learn how to use the "Connecting the SWOTs" technique or other practical tools that will give you a clear career path and amplify your leadership strengths, then join me and my team at our next SMART Power Academy. Be one of 30 other women who aspire to be a force for positive change in the world, in their careers and in their lives. To do so, please join one of our upcoming SMART Power Academies in the SF Bay Area or La Jolla, CA. Click here to learn more and sign up. The first 30 will be guaranteed seats.